Do you think you give the ultimate salon experience to your clients? Do you want to know how are you performing against ultimate salon experience provided by world’s top salon? Do you want to take your salon to the next level where there is no competition? 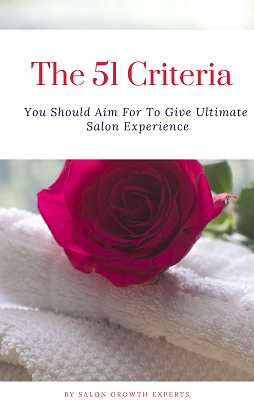 This eBook provides 51 criteria you should aim to give ultimate salon experience. Create a raving fan base. This should be the ultimate aim of your salon. In this competitive world, good is not enough. You need to be better than the best. This eBook help you to find out what should be the ultimate criteria you should aim for and you must strive to achieve. You can go through this individually but it would be more beneficial if you can do this exercise with your team. This eBook has mentioned 51 possible ways, you could attain ultimate perfection. Compile the findings. Now pick criteria for which you have mentioned Always as that could be the biggest reason for your current success. Capitalise and strengthen it. Go through Often and Sometimes reason as well and see how you can improve upon. Never and Rarely may be the area where you can strengthen.